Need to work on that report -- using just your phone? We review five very portable keyboards that could make your job easier. There's no shortage of Bluetooth keyboards intended for tablet users -- some freestanding, some also acting as a screen cover or carry case. Many of them can be used with smartphones, but since most are as big as a tablet, they are less than convenient. One solution is a folding Bluetooth keyboard, which is not only useable by most smartphones, but small enough to easily carry around. In this roundup, I report on five folding keyboards intended for use with smartphones: Cervantes Mobile Jorno, iwerkz Universal Foldable Bluetooth Keyboard, Perixx Periboard-805L, Targus Universal Foldable Keyboard for Android and Zagg Pocket Keyboard. 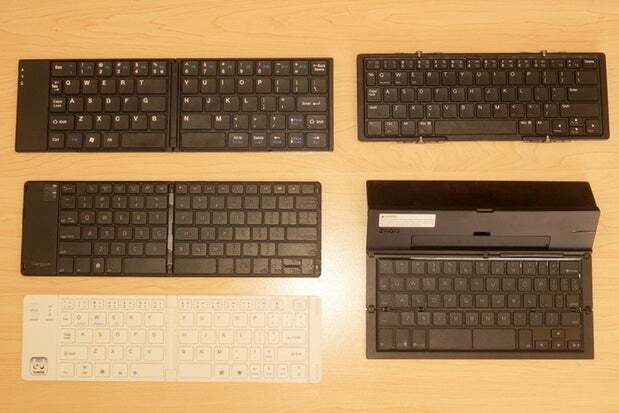 To test the keyboards, I carried them around for several days and used them to type email and documents -- including the first draft of the review for the keyboard in question -- at home at my desk and dining room table, at the public library and at a few other places. In addition to the sizes of the keyboard in open and closed positions (closed size includes the case/stand, if any), I've included the the full width of the keys, from the left edge of the leftmost keys to the right edge of the rightmost keys (e.g., the Shift keys at either side of the keyboard). For comparison, the Shift-to-Shift width of a standard desktop keyboard is about 11 in. Article update: This review was originally published in April 2015. As of March 2016, some prices have changed; these have been updated. All keyboards in this round-up recharge via a micro-USB port and include a USB/micro-USB cable. All fold vertically except for the Zagg, which folds horizontally. The Targus has a dedicated top row of function keys (Home, Search, Cut/Paste, media control, etc. ), while the other four keyboards let the top row of numbers/symbols also act as function keys when accessed in combination with the FN key. The iwerkz, Jorno and Perixx include an FN/keyboard key combination that lets you suppress the virtual keyboard on the display to maximize display space.